Can't download games online directly! Not Recommend watch movie online,this require high quality internet speed! We recommend watch movie or playing games from local! 3D Private Theater for You¡¿:360¡ãpanoramic visual field,embedded with nine-axle sensors,supports 360¡ãview of head tracking(360¡ãhead somatic sensory control),provide more authentic immersive Virtual Reality experience for you. Movies,live concerts,NBA,3D animation,show,Just enjoy it! ¡¾Support Wifi and Bluetooth 4.0¡¿:Based on Android 4.4 customized multi dimension system,Phone no needed,just connect to WIFI,go and search what you like in menu and app.NOTE:Can't download games online directly! Not Recommend watch movie online,this require high quality internet speed! We recommend watch movie or playing games from local! Also support u disk and TF Card alone play. Without Smartphone & PC,you can also enjoy 1080p HD Movie/3D Movie. ¡¾1080P FULL HD VIDEO¡¿:Supports resolution up to 1920*1080,5.5inch TFT-LCD display screen,Refresh Rate at 60Hz(Much higher FPS than average performance),offering more high-definition & fluent frame with low afterglow,enjoy great virtual reality world! ¡¾Anti-Blue Rays Aspheric Lenses¡¿:Provide more pure and offers Undistorted image. You will not feel visual fatigue and dizzy even you use it. Moreover,suitable for people within 0 - 800 degrees myopia, and 0 - 400 degree hyperopia. 100¡ã FOV (super similar to human eyes, giving you a broad perspective) . ¡¾360¡ãPanoramic Visual Field Immersive Glasses¡¿:Bring you into a wonderful game world,fight side by side with your buddies,are you ready? 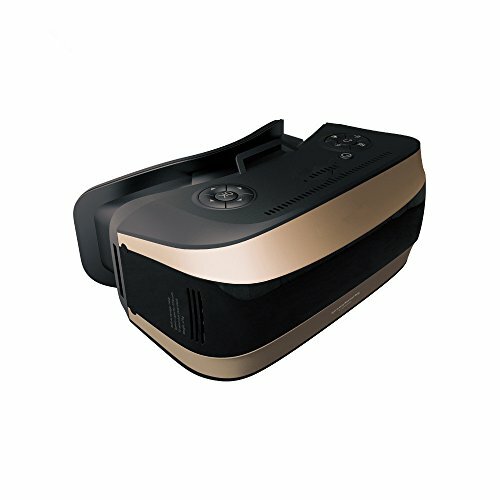 Anytime,anywhere,play what you want to play.Just enjoy your games with this VR Headset for easily operate.